The swimming pool has since been filled in. This page was added on 17/01/2011. I was at Barclay School in the late 50 early 60. The penny brick was an idea used to make money towards the cost of building the swimming pool. We even broke sweat helping to build it. Very popular in its early days but fell into decline far too soon. Sad that it was filled in. The old school students must be upset about it all. The teachers, Mr Lee, Mr French, Mr Monk, Mr Fraser, Mr Jenkins to name a few. Great days. I was also at Barclay school during the 1950`s. I did not see the swimming pool but I am saddened to read it has been filled in as I believe swimming is as much a sport as racing, jumping or ball games. I enjoyed my years at Barclay and recall with fondness our Head Mistress Mrs Carr with her clicking shoes. Maybe some of you will also recall the long ice slide in the playground in winter? I was at Barclay school in 1953-1957 and I remember my parents buying the bricks for the swimming pool. The pool was not built when I left so I didn’t get an opportunity to swim in it. I remember the swimming pool yes it was cold (1961-2), there were plans to heat it using the sun and lots of milk bottles over pipes, and the changing rooms were cold as well. Teacher used to say non swimmers this end swimmers that end I was always a non swimmer. I remember one girl Karen doing 72 lengths that was 1 mile. The decorative tiles that adorn the wall outside the changing rooms still exist after having seeing them at the 60th anniversary celebration of the school opening. Pleasing to know that my ceramic is still there and the moment was shared with art teacher Mr. Wright. 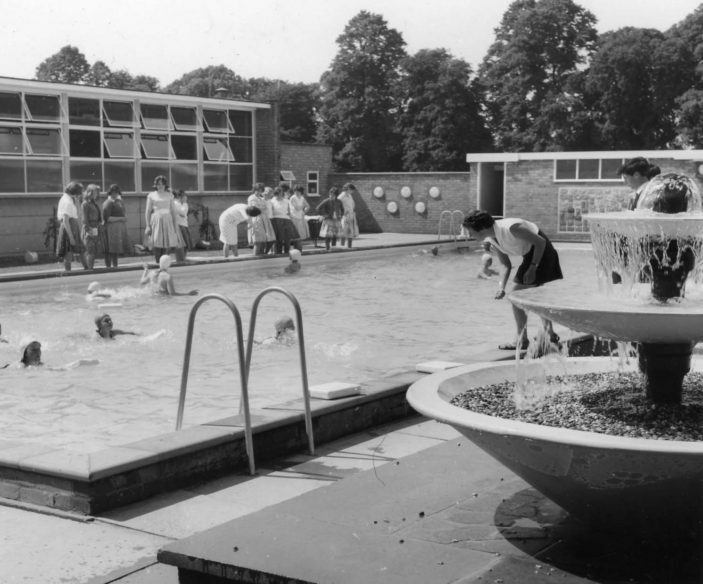 Our Junior School used to use Barclay’s pool. It was icy cold and the changing rooms were very draughty. Not a good way to encourage you to enjoy swimming!